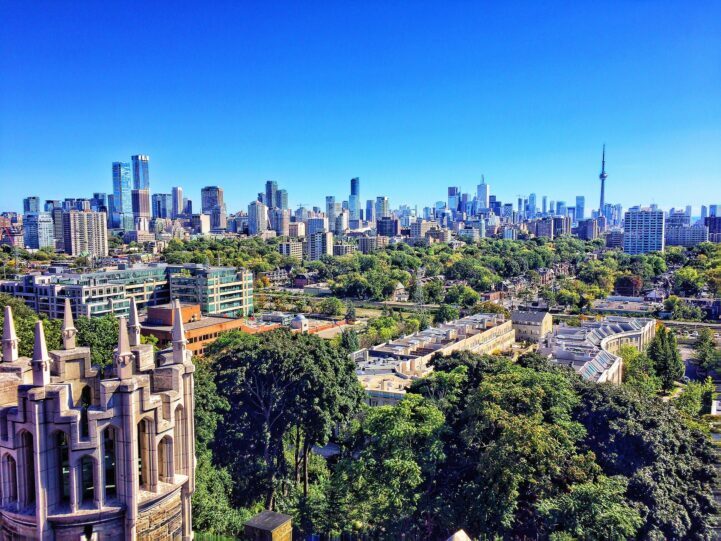 Greater Toronto real estate prices have been soaring largely due to the belief that we’re running out of land. Developers repeat this mantra, and largely blame the province for having “restrictive” policies. A report from the Neptis Foundation destroys that narrative. The non-partisan, urban research organization, actually argues there’s more land available for development today, than there was in 2013. The organization believes Greater Toronto has enough land to accommodate housing and employment beyond 2031. Urban planning is a complex topic, so we’re not even going to pretend we can reduce it to a paragraph. However, there are some terms Southern Ontario planners use, that you will need to to know. Those are the Greenbelt, Inner and Outer Ring Municipalities, and designated greenfield. Let’s quickly run over these. The Greenbelt: The Greenbelt is a permanently protected area the surrounds the Greater Toronto Area. It wraps around the Durham-Toronto-Hamilton corridor. It’s very important to preserve this, and hopefully it won’t need to be touched for a very, very long time. Developers often say this “restrictive” measure is the reason for high home prices. 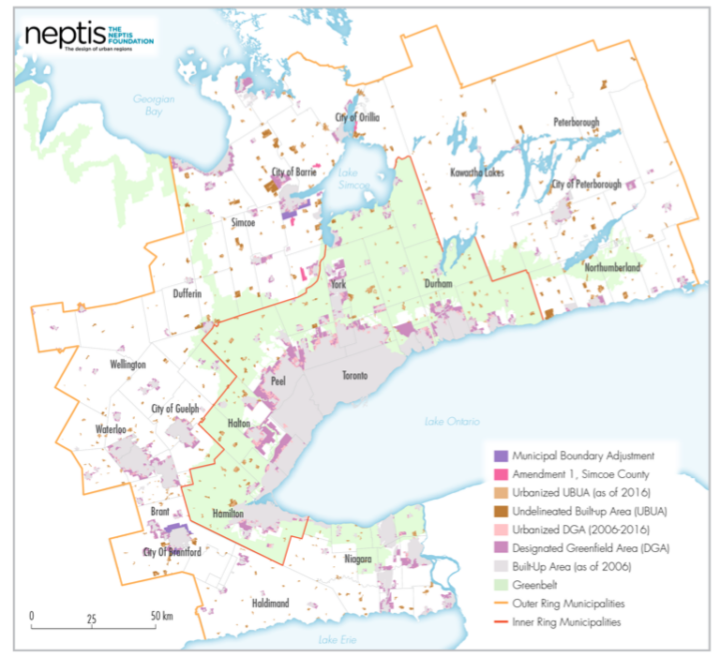 Inner and Outer Ring Municipalities: The Greater Golden Horseshoe (GGH) is broken down into two major planning regions – inner and outer ring municipalities. Inner ring is what’s inside the Greenbelt. Outer Ring is what surrounds the Greenbelt. Toronto, York, Durham, Hamilton, etc. are inner. Dufferin, Guelph, Waterloo, etc. are outer. Designated Greenfield: The province defines this as “the area within a settlement area that is not built-up area.” In non-government speak, it’s the area beside developed areas – but untouched. These are areas reserved for further development. Due to the location, it’s also easy (and cheap) to extend infrastructure, and build housing. Got it? Onward. The province has been adding land faster than we’re using it, according to the gap between Neptis reports. In their 2013 report, 107,000 hectares of land was reserved by municipalities in the Greater Golden Horseshoe, to accommodate growth to 2031. In the latest report, finished in 2017, the province had added about 125,560 hectares, an increase of 17.34%. Hey, that’s something you never hear – an increase of buildable land! More important, is how much of that land is designated greenfield, that can (and will) be used for housing and employment. In 2013, Neptis researchers calculated 107,000 hectares of land available, with 45,660 hectares available as designated greenfield. It was published in their titled report, No shortage of land for homes in the Greater Toronto and Hamilton Area. It’s easy to see how the title would leave some room for ambiguity, on whether there was enough land. Note the sarcasm. In the latest report, that number has increased substantially. Neptis researchers calculate 125,560 hectares of land available, with 103,200 hectares of designated greenfield. About 45,729 of that greenfield is located in inner ring municipalities. Yay! We have roughly the same amount of land reserved for housing as we did in 2013. The report concludes “unbuilt supply of land to accommodate housing and employment to 2031 and beyond.” It’s almost like… it was barely touched. This issue needs to be looked at as land in the City of Toronto, and outside. The City of Toronto has been built up for some time, which means new housing will only be created with further densification. This means prices should rise, but by how much? The CMHC is struggling to explain almost 50% of the increase in prices, which means these were demand-side factors. Demand side factors are best explained as a premium you pay to have something sooner. Think of it like the fee you pay someone to stand in line for an iPhone on opening day. In a typical real estate cycle, this problem gets solved relatively soon after – since developers scramble to cash in, eventually creating hypersupply. Outside of the city is where the problem is, since that’s where most of the land waiting for development sits. Prices in the 905 regions, and as far off as Kitchen-Waterloo, have been rising at a similar rate to the City of Toronto. Most of these regions are far from running out of land, and some aren’t even restricted by the Greenbelt. The assumption that Toronto is going to spill over into these regions is… uh, ambitious. Crunching the numbers, there’s very little reason to believe this, and it actually looks like *gasp* local governments are doing a great job planning land use. Developers have repeated that we’re running out of land, over and over. Heck, even some politicians have even echoed this sentiment, sending people into hoarding mode. People have begun buying property for their grade-school aged children, as far off as Ajax. If we’re running out of land, housing is going to be continue to get more expensive. It would appear to be good financial planning to reserve land for future generations in this case. However, that is not what’s happening. People have been largely ignoring data, in favor of the belief that an extra house or two will be what defines their financial security. It’s like the lottery, for upper middle class people. Anyone that’s ever been above a couple of stories in Toronto knows that’s not the case. We’re not even close to the density of the “world class” cities we often compare ourselves too. Heck, we’re not even as dense as VANCOUVER. It is a joke that there are still detached houses and towns in downtown toronto taking up the same land as a medium sized condo. I mean it is nice and all but the government can’t complain about density targets while allowing two level strip malls to exist all along Yonge Street. What a joke! The worst part here is a non-partisan research foundation needs to analyze the numbers. The province should, and probably does, have a department that should be in charge of letting people know these things. Liberals are either scum, or incompetent. Hilarious, I just saw this in the flesh…my wife and I were driving down from Orangeville through Brampton and Mississauga and there are acres and acres of land already earmarked for (semi-graded, no foliage, light fencing) as well as ‘For Sale’. What I find interesting is when we were booming, 2016/2017, and I was driving the same route there was no signage. It was clear the land was owned by someone and was intended for something but nothing. This isn’t greenblet either, just crap land outside of the ‘burbs. Now that the impending downturn is coming, everyone wants to sell their land off and develop? I don’t get it. Seems like a big fugazi. Absolutely. Even developed land is getting ridiculous. So many pre-sale condos hitting the market. My agent was sending me a new development almost every day in the fall. I just have to wait and put it off, because there’s zero chance I’m buying when you see developers acting this panicked. That’s only 11 years, which isn’t that far off. Those that buy land today are going to be very happy by then. The drop is temporary, that’s a fact. Unless Canada all of a sudden becomes a terrible place to live. However, look at every other country falling apart. You have Drumpf in power, I think we’re good. Alex, you are very selective on the perspective you have chosen to comment about. How “temporary” and how big of a drop is this “fact” of yours? How can you say those that buy today will be very happy by then, when there are countless number of possibilities? The incredibly high and historic debt levels in Canada will create instability and very likely historic inequality unless rates begin to go up (which may cause a recession, and thus a catch 22). It’s tough to tell where we will be in 11 years, but odds are things will be better. There is a constant drum beat of narratives justifying persistent growth, real estate rebounds, price increases, etc. 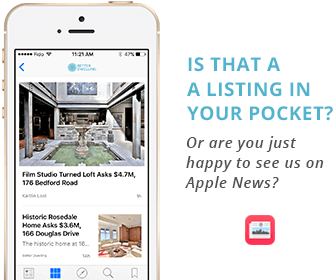 in the Toronto housing market and the surrounding areas. Every week, each of those narratives are shot down, one by one. Yes, 11 years is not far away, and a lot can happen. The most likely thing to happen before 2020, however are continued efforts by central banks to tighten economic policies, while the underlying economy deteriorates. First, by reducing quantitative easing measures, and then by raising rates (4-5 in US, 2-3 in Canada .. this year). From there, the probability of a recession in the next 1-2 years is extremely high. Will Canada become a terrible place to live? No. But will it have a lot of mortgages “under water”, vacant dwellings that can’t be sold, cleared fields where development never started? Yes. The impact that has in terms of bankruptcies, businesses, neighborhoods, municipal tax revenues, will be devastating. You don’t want to be Greece, or Chicago for that matter, having to auction off airports, transportation, public parking, other pieces of public infrastructure, etc. to private companies; just to makeup for a huge gaps in your annual budget. The issue I see with the undeveloped land is that the government has no money earmarked to improve transit for the outerlying areas. Suburban sprawl leads to more traffic congestion and that affects quality of life (less free time and more stress). A large reason why people find being closer to the city/work more appealing is to free up their time and that comes at a premium that people are willing to pay for. The culture of homeownership has changed even in the past 10 years. People are more accepting of living in smaller spaces and living within walking distance or a shorter commute to work. People are choosing to begin families in condos instead of moving to the ‘burbs. People value their time more than ever and realize that time is money and paying a premium to live in a city generates you more time, which can be used to generate a higher income (putting those extra hours in at work) or enjoy more quality time with loved ones. The idea that a parent has to sacrifice their life for the sake of the family by commuting lengthy periods of time to provide for the big suburban house just isn’t fitting with the later generations. We saw what that did for our parents and how little time we had with them. The future demand is largely not in these undeveloped areas. It is within the areas that are developed and need improvements to existing services, such as transit and highway infrastructure. TIL $45 billion in transit infrastructure spending is considered nothing to people that think $500,000 condos are normal. In reality, the province has committed a LOT of funding to connect Toronto and places that seem far today. Most likely we’ll see economic employment clusters form around the region. Wow, how biased, blinkered, and hollow-sounding can you get? you accidentally swallow one, and it lodged in your brain. You get so much time back from living right downtown vs in the burbs with kids. Commute time is the obvious one but just think about life on the weekends, if you live on a quiet street in the burbs and let your kids play outside without adult supervision you probably do need to get up and check on them every few hours. In downtown Toronto there are whole hordes of unemployed adults everywhere! This alone could save you an extra 30-60 minutes each weekend. Sheeet Al, you damn near had me fallin’ outta my seat with all dis know how! Those big words and telling people who they be…didn’t know society had dun gone and changed so much… you must be one of those city folk that be all edumacated and stuff. Our liddle ol’ brains probably can’t understand any of this so Imma just go trade in Bessy and get me one of these ‘condos’ you talkin’ bout…maybe 2! Thanks Al! If you have ever tried to develop land you would know that it can take 5 – 10 years to get to the point where you are allowed to build. So you might be ready to build in 2031. Considering KW has 6-7 major projects with many thousands of homes currently in building stage with infrastructure already developed I wonder how many of the other spaces have already been doing this? And if you’ve been following Southern Ontario development plans, you would know how bat s**t crazy developers have gone. In 2017, enough pre-sale assignments were done to house over 3 years worth of people expected to move to the region. THREE YEARS of developments. In one year. As soon as condos adjust in prices, we’ll start to see inventory soar even further. Right now smart asses think they can hold on to that empty space for just a few more years. How much of that land is serviced? Probably very little. How much of the new housing supply over the recent years is used for actually living instead of speculation? Probably very little. When people say we are running out of land they are assuming you aren’t so oblivious that they need to specify in areas where people want to live. How the hell does having land in North Humberland and Scugog help Toronto. They don’t even want developers building further out they can’t build roads, schools and hospitals 100km in every direction. There’s some irony in you calling anyone oblivious. First of all, all of Southern Ontario saw real estate prices rise at a near identical rate to Toronto. From Hamilton, to North Humberland to Scugog, to Toronto. The rise was 100% idiots like you telling everyone about how scarce land is. Then that gets busted. Then you idiots move on to Toronto has a shortage of housing. Feel free to take a walk in my neighborhood (in downtown Toronto), and look at all of the houses that aren’t occupied, or the condos with dozens of AirBnB lock boxes outside. Even THE CITY CLAIMS 25,000+ houses aren’t occupied. That’s a full year of housing for the WHOLE GTA-HAMILTON regions that could become “available” with just a tax. The provinces has said 121,000 homes are secondary homes, to PEOPLE LIVING IN THE GTA. 14,000 full-time AirBnB’s are going to hit the market when registration becomes mandatory, almost all of them in Downtown Toronto. The shortage of housing in Toronto is NOT related to a lack of building. People like you have distorted the market, and driven people to fear never being able to buy a home. Consequently, they have been paying ridiculous premiums because of lying shills like you.